"Wow, what a remarkable, meditative novel. Jess, the central figure in this book explores the unique traditions, spiritual healing and ancient ceremonies of current day, northern New Mexico. Her quest to find personal meaning in her life, takes her full circle. A thought provoking read!!" "Such gorgeous poetry, a real work of art. I've read some of her other works, and this one is just as thoughtful and beautiful as the others." - Chelsea A. "Church of My Heart, a collection of Debra’s thoughts and meditations, draws the reader into this sacred site. Hopefully, the legacy of her writings will inspire others to protect the Monument." The strength of this novel is in the dynamic development of each of the four main characters. Individually, as couples and as friends Ian, Lauren, Nikki and Paul, find themselves facing unexpected and often unearned challenges in their lives. Surviving life’s most daunting ordeals they find that these events break their hearts leaving them able to become the heroes of their own lives. 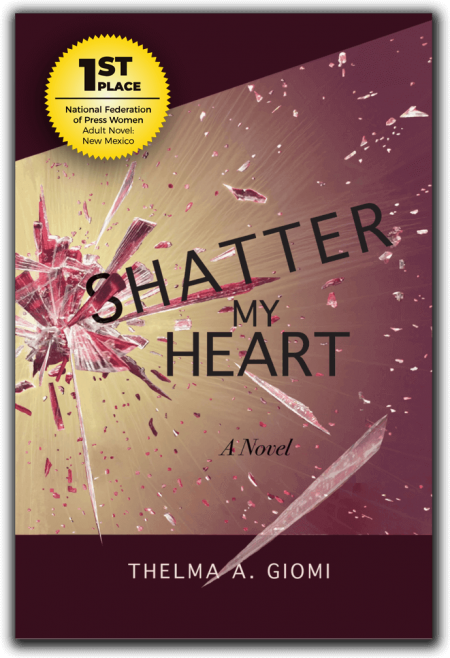 Shatter My Heart is the compelling story of four unique and gifted individuals who find that to live fully they must be willing to be wounded by life’s blessings. Deeply felt; explores the complexities of human relationships, illness, and the ability to change. Shatter My Heart should be titled Capture My Heart. I found as I read this new work of Thelma’s, my heart was captured, and I wanted to read more and more. The situation is intriguing and the characters are captivating. I found that I wanted to know these people and discover how they worked through their issues. Definitely a good read. The author’s ability to use descriptive phrases shines through this book and gives the reader effortless insight into the four main characters, which is one of the strongest points of the novel. Skillful and poignant writing with a compelling premise. This is a compelling story of the challenges faced by four exceptional people who won my admiration and friendship. There are few books that I would re-read. This is one. It’s compassionately told with outstanding attention to detail.